The word “universe” in last week’s big announcement jumped out at many fans. 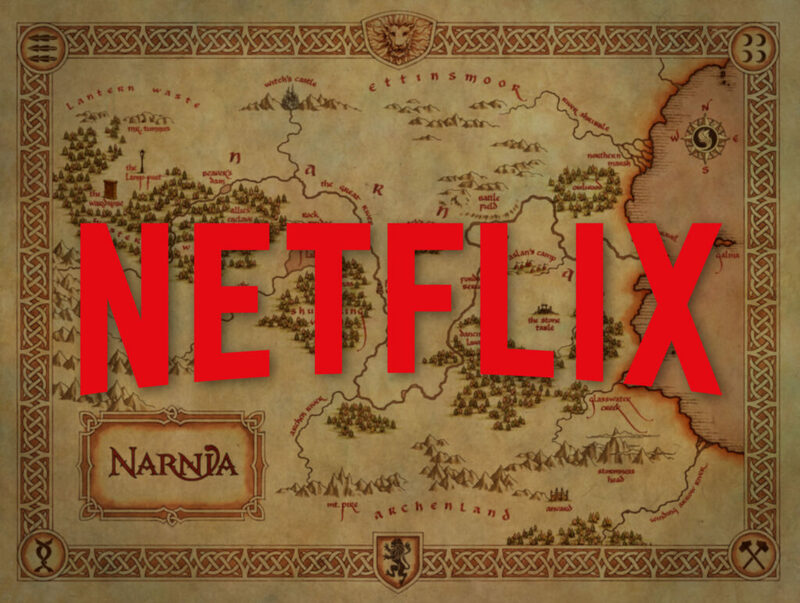 Netflix is developing The Chronicles of Narnia feature films and episodic programming, and many fans are wondering what uncharted waters these new adaptations might take Narnia through. Listen to our discussion below and post a comment! Thanks for a great podcast as always, guys! I’m really looking forward to seeing these conversations develop in the future with more news. If they decide to, say, have the series be based on the books and the movies or vice versa, that might be convenient for the people who don’t want them to create original stories. We could just watch one and not the other. I have dim memories of glancing through A Giant Surprise while I was at a bookstore. While I didn’t think it was very good and I’m against later authors continuing the beloved works of a dead author, I didn’t hate is as much as other Narniawebbers. This was mainly because they chose to do a spinoff based on a lesser known character rather than a more famous one. My brother actually likes Rogue One Better Force Awakens or Last Jedi. I think at this point, most of us have got such a bad case of "Narnia-withdrawal" that we’d be glad for any Narnia adaptation regardless of whether it’s a loosely based "inspired by the universe" sort of thing or a by the book series. And the first would probably include the second: non-canonical stuff would be injected between the books. Perhaps the plan is to use these Narnia "short stories" as episodes and make all the books into feature length programs. If so, I think most of us would be very happy. I would rather see nothing at all than see a bad adaptation produced. I was referring to the format and content of the stories ( meaning the whole thing about episodes/short non-canonical stories) when I said Narnia fans would be happy to see any kind of Narnia adaptation. I wasn’t talking about the actual quality of the programs. (in terms of good drama, not necessarily book-faithfulness) But I think on the whole I’d have to say that I also would rather just content myself with old adaptations and the books themselves if the Netflix series ruined it. I’m starting to think I’m way more concerned about this then anyone else is. For the record, I don’t think the sky is just falling yet, but I’m mentally preparing myself for it to fall later. Hopeful I’m dead wrong and Netflix is just planing to adapt the books, and that Gresham would never allow spinoffs. But that’s sure not the impression I’m getting. I think part of the reason why I’m worried about it (apart from how much I absolutely despise the thought of Narnia stories not written by Lewis.) Is that doing that kind of spinoffs, to me, almost always feels like a cynical cooperate way of squeezing as much content out of a recognizable brand name as they can. Maybe this is going to far, but, I’m starting to think I’d just prefer that they stop making adaptations altogether and leave the books alone. Never thought I’d say that, but that’s kind of were I am right now. I suspect most NarniaWebbers are equally horrified at the idea of spinoff stories, but few consider it likely enough to truly worried at this point. I think you’re probably right that we don’t have to worry about Netflix did something like that in the short term. But, even if they did make amazing adaptation of all seven books, I don’t think I would be any more open to the idea. For me doing original Narnia stories is one of the lines I would never what to see crossed. I totally sympathize with you, nf7, but here’s the problem: sooner or later, The Chronicles of Narnia is going to fall into public domain. If 70-years-after-the-author’s-death applies, then that would mean around 2035. Not very far away. Whether we like it or not, that’s a Pandora’s Box that is going to eventually open. That’s a big reason why I’m thrilled that they’re going to adapt all of the seven books *now* when people like Douglas Gresham still have control, because that opportunity isn’t going to last forever. I don’t know whole lot about copyright lews but, aren’t copyrights renewable? Turns out that U.S. copyright law is a little bit of a headache, but according to my research, the life of the author + 70 years after death applies to CoN. So we’re looking at 2034. I’m not aware of the C.S. Lewis Estate being able to extend the copyright through renewal, but Congress has acted to extend the terms of copyright law in the past, so that is a possibility. Lewis’s writings are already in public domain in Canada, where copyright expires fifty years after the author’s death. This used to be the same as U.S. law before the Copyright Term Extension Act of 1998 extended the time frame to 70 years after the life of the author. I understand why some may prefer that others not write Narnia stories. However, I read a book many years ago by C.S. Lewis (I’ve forgotten the title) where he himself encouraged others to continue his story by writing their own stories, essentially building onto the Kingdom of Narnia and the outlying lands. Perhaps someone here remembers the book. I believe it was a child’s biography of C.S. Lewis. I remember that too. But in context he was encouraging people to write fanfiction. He didn’t mean that the stories they wrote should become officially part of the Narnia canon. That’s true, AslansLucy. It looks like it was in a reply Lewis wrote to a letter from a boy named Jonathan who said he hoped Lewis would write more Narnian stories. Lewis said he wouldn’t be writing any more, but suggested that Jonathan try writing some Narnian tales himself. So Lewis was definitely open to other people exploring the universe… although fan fiction written by schoolchildren is quite a bit different than Netflix creating whole series based on gaps in Narnian history! Here’s the thing: as Gymfan pointed out, if they were to ever make spin-offs, they’d likely not do it until the seven books are adapted and released. At that point, I’ll already have seen my favorite book series on screen and I can choose to ignore the spin-offs. I’m hoping that all the books will be feature films, and the spinoffs will be put in episodes. "Within reason" … I’ve been having a little bit of difficulty figuring out exactly how much I’m okay with a series expanding on the books. I really like the big battle scene in LWW, for instance, which got very few lines in the book, and I also thought that the night raid in PC worked in a lot of ways. So there’s definitely a case to be made for adding or expanding the material in a film adaptation, but where do you draw the line? I think the people writing the spin-offs should be experts in The Chronicles of Narnia & C.S. Lewis’s other works (both fiction and non-fiction). That way, they are much more likely to write in his style and with his worldview. – Changes to character attributes such as making some characters gay (Like Anne with an E). Walden’s Prince Caspian – and in my opinion, they did not even execute it well at all). – Going to the "Wood Between the Worlds" and going to new worlds which aren’t Charn, England or Narnia. – Modern settings. E.G. The Pevensies are from 2019. – Intense dark themes not in the books. – Ignoring visual elements described in the books. E.G. There are guidelines in the books for how the Calormene nation and people look. I agree that some changes will need to be made, but don’t hesitate to make the Calormenes look slightly Eastern or Middle Eastern – they do look that way! (Be bold and sensitive about that, not overly anxious and political correct). – You must keep the Christian elements. @Rose-Tree: I totally hear you. The line has to be somewhere. Here is why I believe both examples you give are within reason. 1. They are both based of the events that occurred in the books. With LWW it’s more obvious. That battle happened without question. The night raid on the other hand (and my brother had to point this out) is a repurposed event that, in the book, took place before the Pevensies ever arrived (Chapter seven, “Old Narnia In Danger”). It’s described that they hung all their hopes on it and it goes terribly wrong. 2. They both work for the themes present in the books and don’t distract from it. The line is when you get filmmakers saying “we’re telling the story that C.S. Lewis didn’t write” (Michael Apted). The line is adding a green mist, expanding the universe just for the sake of expanding it. I’m okay with them fleshing out implied events if it helps tell the story well. That’s the kind of treatment I was speaking of, which is why I chose the HHB example. Another would be in Last Battle. Actually show the friends of Narnia get together from their perspective. Or what happens (briefly) when Roonwit returns to Cair Paravel. All these events are canon to the books. They just aren’t shown. Does that make sense? Jonathan Paper, I probably shouldn’t bring up such a controversial topic but how do you think people should be sensitive without being politically correct? Both those things basically mean trying not to offend people. I think with the Calormenes they’re going to focus on the beauty and advancements of the culture (because when you think of it, Narnia really isn’t really technologically advanced) and blame most of the last admirable portions on the Tisroc’s power/tyranny. I think what JP is getting at is don’t portray the citizens as people who are like yeah let’s sacrifice people on the altar for funnsies! Maybe similar to how Prunaprisma and Glozelle (sorry I have no idea how to spell their names) made the Telmarines more sympathetic because they didn’t want to murder Caspian/were too scared to do anything about Miraz. The Rose-Tree Dryad, I got a feeling any expansion of the World of Narnia in the next few years will occur directly inside the adaptations themselves (miniseries or episodes) and not as spin-offs. Jonathan Paper, I agree about not ignoring the visual aesthetic of the books, but if the Calormens are presented as English stereotypes of Eastern people, what’s the point of adapting HBB? It’s a great book, if you overlook its problems. I just want the Calormens to feel like a real and tangible threat to Narnia – even if they depart from the book’s discriptions. JFGII I agree, the Calormenes should be portrayed as extremely competent, Rabadash might have bad battle plans but their Tarkaans are experienced warriors with good strategy. Keeper of Lantern Waste, you’re thinking of this line from King Edmund. "For though my brother, Peter the High King, defeated the Tisroc a dozen times over, yet long before the day our throats would be cut." "Though" in this context means "even if." He isn’t saying they actually did defeat The Tisroc a dozen times over. He’s saying it wouldn’t help them if it did hypothetically happen. I think there is a continuum between insensitive, sensitive and being overly politically correct. So if my "Sensitivity Continuum Theory" (LOL), being sensitive in a reasonable way is not as crazy as being overly PC. For example, I believe there is a way to portray the visual aspects of Lewis’s Calromene culture in a way that is faithful to the book without being unfair to Middle-Eastern people, and without being cringeworthy. That is why it works in the novel! Because it is a world so clearly defined. And as someone pointed out in a podcast on this topic, there are other aspects that are not from Middle Eastern culture, such as red beards, the tombs and the saying of the poets, and Tash. Best plan? Start with a feature-length "Magician’s Nephew" movie this time so the launch won’t be muddied with comparisons to Walden … (BTW/IMHO, Aslan is introduced beautifully in TMN; even better than in LWW where the Beavers spoil the surprise by saying he’s a Lion) … Then, do all the books as features, Chrono Order, with HHB after LWW & before PC; "Dawn Treader" could in fact be TWO 90-min features … THEN, if that big plan is a great success, consider generating some Narnian Apocrypha … Though I’d point out that Disney just backed off their "Star Wars" stand-alone ambitions. "Too much, too fast" I think were Bob Iger’s words. Pretty sure I’ve seen fake Narnia netflix posters online before the Netflix Narnia thing was even rumored. I thought Walden had the rights to all seven books. Was I wrong? I mean *used to have the rights*. According to Narnia.com, the Netflix deal marks the first time the rights to all seven books have been held by the same company. Does this mean that Disney/Walden only held rights to part of the series, or does it technically count as the rights being split because they were being held by two companies? Is this why the BBC only made tv movies of four of the books instead of all seven? To be more accurate: VDT underperformed, which caused negotiations to fall apart between Walden, Fox, and The C.S. Lewis Company. It’s been my impression on the past that the CS Lewis Estate has been wary about giving the rights to all the books away at once. It makes sense that you’d want to see how much you can trust a company with such a beloved franchise before handing it all over. Perhaps that means there was something about working with Netflix that put them at ease this time. The fact they are willing to give them to rights to ALL the books must be for a positive reason, right? I don’t believe Disney ever had the rights. To my understanding, Walden had the rights to Narnia books and Disney came on board as a co-financier and distributor. I hope that is correct. I did some research and yes, it looks like you’re correct. Like I have written before, I really think that Netflix is our last chance. There will be no more studios after this. Let us hope that Netflix get the books right. The small screen is better than no screen. For the record, I hate the idea of writers messing around in Narnia and creating all sorts of back stories and side stories and hogwash that dilutes Lewis’ vision and written word. I think a mini-series entitled "Charn" might be very intriguing. I have always found Jadis’ tale of the fall of Charn in the Magician’s Nephew to be fascinating. That’s her version of it, her viewpoint. Talk about an untrustworthy narrator. Part of me really wonders what it would look like… a political thriller set within the palaces of Charn, intercutting with the armies and generals as the end of the world approaches. How does a civilization crumble? How does a world end? How does a royal family rot from the inside? The best part of a Charn spin-off would be that it would have virtually no connection (besides Jadis) to Narnia. There would be no mucking around in Narnia. No "Wolverine Origins" to some poor Narnian character. That’s a good point about a Charn spin-off potentially being more tolerable because it’s not set in Narnia. It’s essentially a prequel to Narnia’s prequel. Although when thinking about it, I find myself just really wanting Lewis to tell the story of her early life in greater detail… nobody could do it better than he could! I would be happy with a Charn miniseries, done well. By "done well" I mean: written with care and skill, and executed at a high standard of production quality. I’d be much more open to a Charn spinoff as well (as oppossed to Narnia). I agree with you on that one, Rose Tree Dryad. Man, Lewis left so many tantalizing story threads. Charn. The wood between the world…I mean, there are so many brilliant story starters there. All the characters he created. It’s interesting. My theory is that Lewis had just as many thoughts, ideas, and stories as Tolkien did. If he had wanted to, he could have filled up volumes with mythologies. Instead, he chose a different strategy. He chose the "less is more" strategy. Which is fascinating. But almost taunting for Narnia fans. So many amazing stories within the world he created! However, without reservation, I wouldn’t mind seeing the fall of Charn somehow spliced into the Magician’s Nephew. oh I have so many thoughts on this… but I will try to keep it brief until i get on the forum. The fact that they use this term in conjuction with them stating that they are making both films and series gives me pause because I wonder if they are thinking of making a spinoff series and leaving the books for the films. I would tolerate this idea with caution, but I don’t like it… at least not yet. Maybe if they do a great job with the books and they stay true to Lewis’ themes and core beliefs I’d give it a shot… but as of right now I don’t like it. So what do I think they are going to do? Assuming they don’t take the approach outlined above there is still a few possibilities. I think regardless Dawn Treader will end up broken up into a miniseries… it is certainly what I hope they do, it is so episodic it just seems to work best that way. PC will either be developed as a film, but restructured to avoid the giant flashback as the Walden film was or it will be broken down and combined with VDT as in the BBC version. (Personally, I am rooting for a film version sans angry Peter and Suspian). MN and SC I think will be made into standard films. The Last Battle I think they will make into a two or three part film series a la the Hobbit or Dinotopia. That leaves us with the wild cards… LWW and HHB. Both books are structured in such a way that they lend themselves well into classic film format (LWW has certainly proven this), but if Netflix is going to bring about a multiseason show I think it will happen over the timeperiod of the Pensevie reign, which means they could combign these two books into one series and then flesh out the stories in between so they have more content to work with… Not saying if I want that or not, but I could see someone i Netflix suggesting that. I doubt that Netflix will repeat the flaws of PC (the angry Peter and all that Suspian bosh). There would probably be a drive to keep the series distinct from the Walden films. I agree that VDT would make a good episode series. I think the best idea so far was suggested by JFGII, saying that the Pevensie trilogy should be episodes and the rest would be full films. Of course I’d be just as happy if they made all the books into films and just made spinoff episodes. Then I could just get the DVD’s and pretend the spinoffs don’t exist. I’m still not sure what to make of the series and movies thing, but I am looking forward to seeing all 7 produced by the same company. I have enjoyed almost every single Netflix original show that I have watched. Streaming services are producing excellent content nowadays and I hope that continues to hold true. I’m feeling really good about this right now. I mean, I always enjoy being optimistic and excited in the early stages of projects like these — you might as well, right? — but I’ve wanted to see Narnia made for a niche audience for a long time, and I also think the books could work so well as a television series. (Especially stories like VDT.) Obviously I’m very curious to see what kind of creative team assembles and what kind of budget we’re looking at, and I’m definitely keeping my eyes peeled for any interview or announcement that tells us exactly what "films and series" means. All in all, though, I’m on board and very excited to see where this journey takes us. I am excited to see adaptions for all 7 books! I think that VDT and PC would be best as a series and the rest as films. Either way, I’m looking forward to this, especially seeing my favorite book, The Horse and His Boy finally adapted for (whatever) size screen! I’m fairly optimistic about the move to Netflix. Narnia is one of the series of books that I’ve most wanted to see adapted "fully" (i.e. all the books produced with more than a quick pass at the source material that can sometimes come with theatrical films). I was a big supporter of the Silver Chair film as far as we knew anything about it; I love David Magee’s screenwriting and trusted Joe Johnston to direct. Maybe we’ll still see that film come to light. I know Netflix *can* produce faithful book adaptations (their Series of Unfortunate Events show does a fine job as far as I’ve seen) but I do feel a bit of hesitation because there’s a lot of room for bad adaptations to sneak in. Overall, I’d say that I’m happy about the move to Netflix because it represents an opportunity to produce filmed versions of the books that take their time with the story and themes that Lewis wrote and present them to a new audience (I won’t say "for a modern audience" because that implies the sort of "updating" and "expanding" that resulted in the "book C.S. Lewis didn’t write". I will say that if any shows or movies are produced as a result of this deal that aren’t direct adaptations of the books (i.e. Jadis’ time before Magician’s Nephew, the years in between books, etc.) I’ll be more hesitant to get on board. On the one hand, I am always curious to see more glimpses of Narnian history; on the other, I’m cautious about the idea of fiddling with Lewis’ opus. One topic that I’m waiting to come up is the soundtracks and how widely they will differ from the Walden music. What exactly are we looking for? There are so many ways a music score could be done for Narnia. Some good ways, but mostly bad. The Lord of the Rings film score is the gold standard for me, not Harry Potter or disney film scores. I’m difficult to please, but I like to be surprised in a positive way. BBC’s TV Narnia score was exactly what you would expect: It’s dignified and uplifting. It’s also boring in its lack of variation and scope. Focus on the Family’s radio music for Narnia was their usual Saturday morning music: Occasionally stirring, but mostly bombastic and corny. Walden Media’s film music for Narnia started off in an inspired way (Harry Gregorson-Williams music for LWW mixed traditional hollywood scoring with both electronic and forign musical instruments to great effect). However, the score is also obviously trying to compete with The Lord of the Rings and Harry Potter (not to mention other disney films) and so it comes off as sounding a bit overblown and portentous. PC was made worse because of the latter. VofDT threw out all of that previous effort by removing the original composer and doing a cheesy and lazy hollywood score (some parts are copied-and-pasted directly from composer David Arnold’s previous films).